Most of the corporate events and themed parties we organise are bespoke. No-one wants to see the same old décor, food, drink and entertainment done in exactly the same way, year after year. In summer, we threw a circus themed 21st birthday party at Stapleford Park near Melton Mowbray in Leicestershire. Here's what the birthday girl wanted and how we made it happen. Our mission was to create a fabulous circus in the middle of the countryside. We're talking big top action, impressive acts, show-stopping décor; in short, the full works. Making magic was the main goal of this circus themed party. The idea was to literally make guests gasp with wonder and awe. It was the imaginative touches that really made an impression. 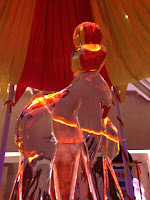 On arrival, guests were greeted by the sight of a huge vodka luge showcased on a plinth. Never encountered a vodka luge before? It's an ice sculpture with a hole drilled in the top and an exit hole in the side. The vodka is perfectly chilled by the time it gets to glass or mouth. Clever, eh? Batons, backlit silhouettes and illuminated carousel table centres set the scene for dinner in the main room, along with striped big top-style ceiling draping. Waiters brandished blow torches whilst entering the room with dessert, lighting the sparkle puddings as they passed through. We arranged an aerial act as the main entertainment, backed up by a neon glow show that received plenty of oohs and ahhs! An LED dancefloor was laid especially for the night, with the red and yellow lights switched on after the entertainment. It was a call to the dancefloor that worked a charm! Want a unique themed party or corporate event? Call the events team on 01773 766050.